Anaïs Nin is one of those writers that is known more for her quotes than for her works, a lot like Oscar Wilde. And the quotes that made it most frequently out into the world on tote bags and tank tops always made her seem a little fluffy, and very girly. So I admit I unfairly judged her by that and never really delved into her novels. 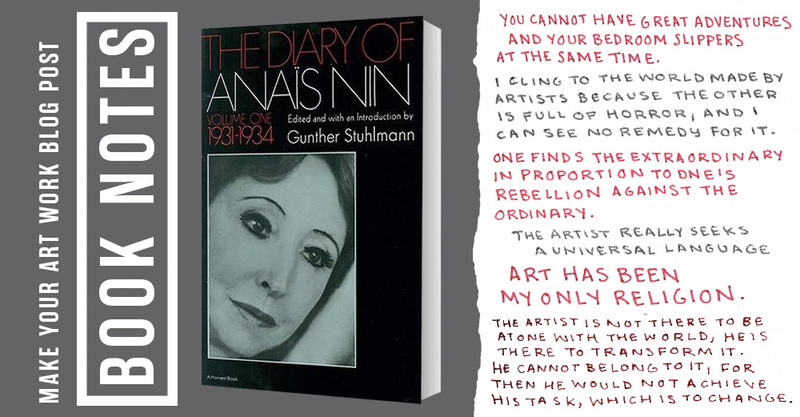 It wasn’t until recently that someone who knows about my sketchbooks brought up an interesting fact that Anaïs Nin was actually better known for her intense and hyper-observant journals than any of her fiction, and I perhaps would find a kinship with her thru the journals instead. I am so glad I got that tip, because I have learned so much thru the gateway of her diaries. Anaïs’s early journals focus on her life in Paris in the 30s, with the threat of World War II looming. She was not only central to the world of artists and writers and intellectuals of that (in)famous Paris scene, she was somewhat of their den mother. She was fortunate (or unfortunate, depending how you look at it) to have some money, and took it upon herself to feed and encourage the artists she saw struggling. She was the one to buy Henry Miller a typewriter and get his first book published. All the while she was toiling away at her own novels. She kept the journals as a way to record observations of life she might spin into fiction later, but her observations are so true, and so illuminating, it seems a crime to then alter them to fit into her stories. To be fair, much of her fiction is thinly-veiled memoir as it is. Anaïs became fascinated with the new science of psychoanalysis as a way to understand herself and to assist the artist community, and became a protege of Otto Rank. Over time she started seeing patients herself, and while she struggled with forming healthy boundaries and taking on too much of her clients’ emotional fallout, she remained Rank’s translator and often co-writer. Her journals led me directly to Otto Rank’s Art and Artist , and that book is a treasure trove of info for artists and I’ll be doing a Book Notes post on it soon. 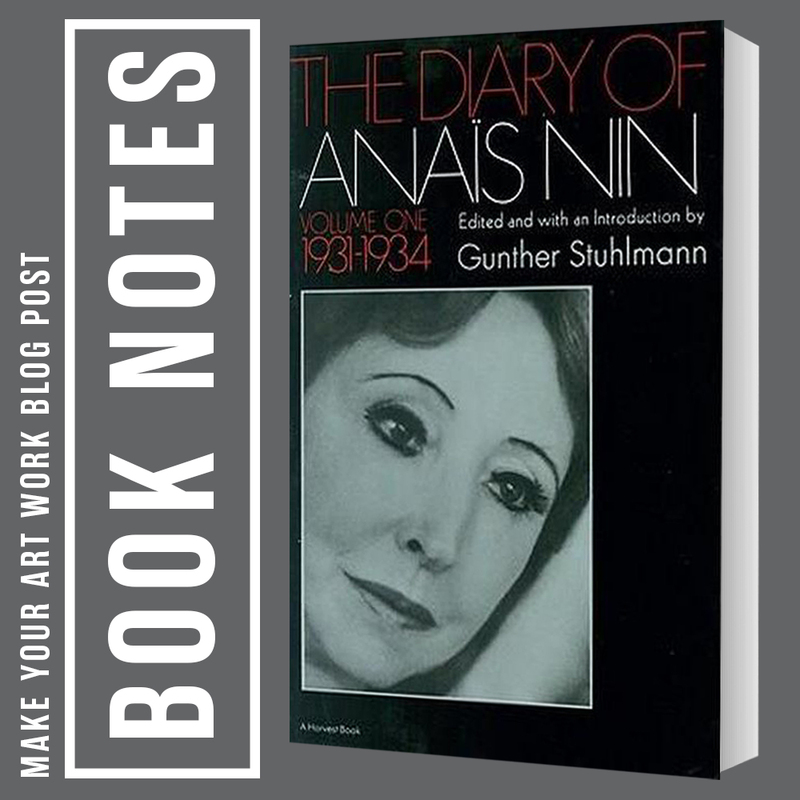 I can wholeheartedly recommend reading Anaïs Nin’s journals for any writer, artist, or other creative, who struggles to balance the everyday world and their creative drives. Her insights as a woman in a very sexist age are especially valuable for both women and men to read. The strength of her ideas and observations perfectly phrase feelings I guarantee you have struggled with your entire artistic life. I would recommend starting with Diary 2 (1934-39) if you want to skip over her youth and teen life and want to start where she really starts getting involved with the artist community. 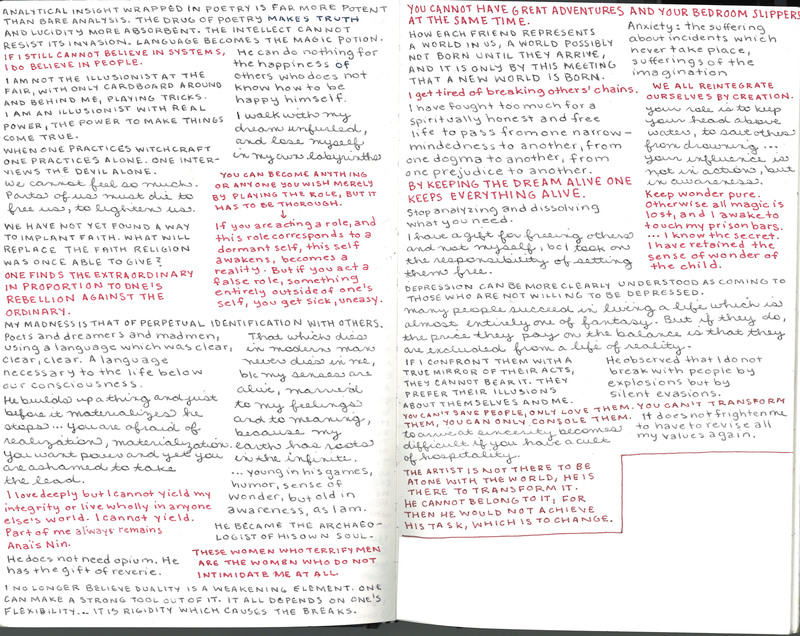 Background on the “notes” part of Book Notes: When I am reading a book, I am a obsessive underliner (especially of non-fiction books). After I’m done, I copy anything I want to remember into my sketchbook. It’s kind of like making a personal cliff’s note. 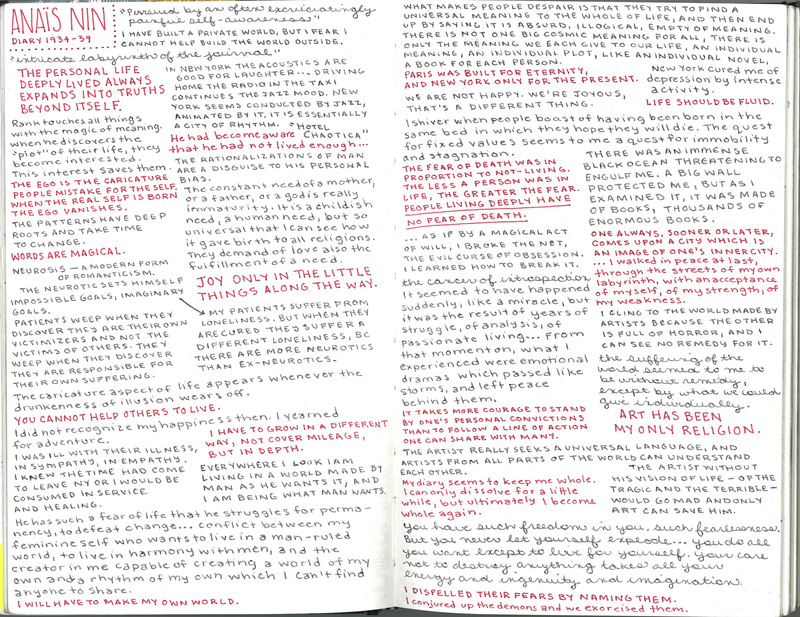 This column started because many of the people who have seen my sketchbooks over the years wanted access to some of the pages on books or lectures they were interested in (I make the same kind of pages for classes or seminars or talks too). Since I am reading books through the lens of an artist, I wanted to start sharing these notes and condensed reviews with other artists. If you lil the tone of the notes, then pick up the book.